Creativity is an important human quality upon which many achievements of humankind are based (Thys et al., 2013). It has been known for a long time that people with salient social and artistic creativity suffer more frequently from psychiatric illnesses than the average population (Rihmer et al., 2006). Extremes in mood, thought and behavior--including psychosis--have been linked with artistic creativity for as long as man has observed and written about those who write, paint, sculpt or compose (Jamison, 1989). From a scientific perspective, several distinctive depressive episodes can be diagnosed in Goethe's life. They were characterized by extended depressive moods, lack of drive, and loss of interest and self-esteem combined with social retreat. Goethe displayed diffuse and phobic anxieties as well as dysthymia (Holm-Hadulla, 2013). Nager (1991) indicates that Goethe was subjected during his whole life to extraordinary psychic threats and polar tensions often to the limits of destruction. For long periods of life he travelled in the mist of depression. 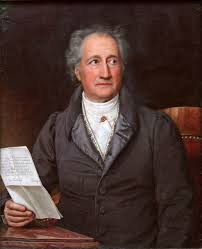 Goethe's first depressive episode occurred when he was 14, following the termination of a love relationship and was characterized by withdrawal, anorexia, and indications of suicidal intentions (Grossi, 2011). In Goethe's life, creative incubation, illumination, and elaboration appear to have been associated with psychic instability and dysthymia, sometimes with depressive episodes in a clinical sense. On the one hand, his creative work was triggered by anxieties, dysthymia, and depressive moods. On the other hand, his creativity helped him to cope with psychic disorders and suicidal tendencies (Holm-Hadulla, 2013). He rather faced his spiritual sorrow creatively and forced it into curative poetry (Nager, 1991). …..In the morning, at six o'clock, the servant went into Werther's room with a candle. He found his master stretched upon the floor, weltering in his blood, and the pistols at his side. He called, he took him in his arms, but received no answer. Life was not yet quite extinct. The servant ran for a surgeon, and then went to fetch Albert. Charlotte heard the ringing of the bell: a cold shudder seized her. She wakened her husband, and they both rose. The servant, bathed in tears faltered forth the dreadful news. Charlotte fell senseless at Albert's feet…. (The Sorrows of Young Werther - Johann Wolfgang von Goethe). By writing ‘The sorrows of young Werther’ Goethe exorcised his own suicidal impulses and thoughts, thus probably saving his own life (Pöldinger, 1986). However according to Pirkis and Blood (2001) Goethe's The Sorrows of Young Werther had led people to take their own lives. Werther’s tragedy is the tragedy of bourgeois humanism and shows the insoluble conflict between the free and full development of personality and bourgeois society itself (Dubey, 2009). Goethe's play Torquato Tasso was based on actual events. This play was about the sixteenth-century Italian Renaissance Poet Torquato Tasso. In his play Torquato Tasso, Goethe narrates about a depressed self-destructive poet and how he overcame his depression through communication and artistic creation. Cabras and Lippi (2007) elucidate that Torquato Tasso's psychiatric illness suggests the diagnosis of an Affective Disorder: "Bipolar Disorder with mood incongruent delusions" or "Schizoaffective Disorder"
Experts consider Marienbad Elegy poem as one of Goethe's finest and most personal. Marienbader Elegie which is part of a trilogy that revolves around depression and suicidality (Grossi, 2011). In 1798 Goethe experienced a severe episode of depressed and he began to write his tragic play Faust. Faust can be viewed as his monumental tragedy (Grossi, 2011). The play is based on Faust - an audacious man who sold his soul to the dev il, Mephistopheles. He made a bargain with the devil for enormous power over the earth. The part one of Faust was published in 1805. Faust, was an essential source for both Freud and Jung, and it played an important role in the foundation of depth psychology. Jung postulated the devil as the "missing" fourth that completes the Trinity image, associating evil with the feminine which has long been suppressed within Western culture. Jung suggested that by recovering the feminine, the individuating Self redeems the shadow side of God, (Gabriela, 2009). According to the Psychiatrist and Jungian Analyst Dr. Edward F. Edinger Faust is a prototype of modern man, whose curiosity has led him into forbidden regions of various kinds, at the risk of the damnation of the soul. Goethe's masterpiece Faust demonstrates the coincidence of real life subjects and objects with literary subjects and objects represented, by means of the interpretation of the paradigms, problems, dilemmas and identified cases of medical ethical-morals: dáimon, reflection-solitude, free will, good-evil, Eros, learned ignorance, genes, epistemology, medical etiquette, paternalism, anatomy of the personality, Hyppocratism, will, good sense of humor, bubonic plague (de Castro-Peredo, 2006). Binswanger and Smith (2000) stated that Faust, representing modern man, carries out this massive project of economic progress, but Goethe also shows the existing and potential dangers associated with it. Writing Faust was a therapeutic and self healing effort for Goethe. It helped him to battle his own demons. His mental illness was not known to his doctors. But they suspected melancholia in him. Goethe by himself distinguished his depressive moods from “poet's melancholia” which was fashionable at his times (Holm-Hadulla, 2010). Cabras, P.L., Lippi, D.(2007).Pathobiographyand Torquato Tasso's case. Med Secoli. ;19(2):475-80.
de Castro-Peredo, H.F.(2006).Goethe's philosophical-medical masks, in Faust.Gac Med Mex. ;142(6):519-31. Dubey, A.(2009). Goethe's epistolary The sorrows of young Werther. Shodh, Samiksha aur Mulyankan (International Research Journal)—ISSN-0974-2832 Vol. II, Issue-7. Gabriela, L.A.(2009).Two souls dwell within my breast: The encounter with shadow and the problem of the missing fourth, a Jungian interpretation of Goethe's "Faust". Pacifica Graduate Institute. Holm-Hadulla, R.M. (2013).Goethe's anxieties, depressive episodes and (self-)therapeutic strategies: a contribution to method integration in psychotherapy.Psychopathology.46(4):266-74. Nager, F.(1991).Goethe's struggle with depression.Schweiz Rundsch Med Prax. 17;80(38):984-91. Schäfer, H.H., Sivukhina, E., Dölz, W., Oehring, H.(2012).Fiction and Truth": Goethe's anatomical research at the University of Jena.Dtsch Med Wochenschr. 137(51-52):2722-8. Steinberg H.(1999).The "Werther effect". Historical origin and background of a phenomenon.Psychiatr Prax. ;26(1):37-42. Thys, E. , Sabbe ,B., De Hert M.(2013).Creativity and psychiatric illness: the search for a missing link--an historical context for current research.Psychopathology. 46(3):136-44.